Sushi, is sushi, is sushi…right? So how does a sushi company stand out in an increasingly crowded sushi marketplace? The sushi company simply creates, a point of difference; a uniqueness. So is it the strange name of St.Pierre’s odd enough to stand out? Apparently not. But what does make St.Pierre’s unique, is their ingredients. Notice how every ingredient seems to be absolutely authentic. 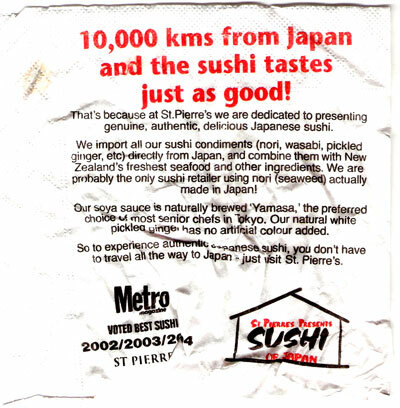 The word that St.Pierre’s seems to own is ‘authentic.’ Their nori, their wasabi, as well as the pickled ginger seems to be coming from some hallowed Japanese location. Even the soya sauce seems to be authentic. But that’s not the point of this post. Creating uniqueness is fine, but if you don’t propagate uniqueness, you’re doing diddly-squat. So what does St.Pierre’s do? They put this information on every paper napkin that’s handed out with a box of sushi. Every napkin tells the same story. Time and time again. And so every time you eat another bunch of wasabi-laden sushi rolls, you’re reminded about their uniqueness.